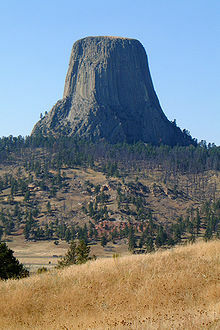 Devils Tower National Monument, Wyoming. This is an igneous intrusion exposed when the surrounding softer rock eroded away. An intrusion is magma (melted rock) which cools and becomes solid under the Earth's surface. It occurs when there are lines of weakness such as faults, joints, or bedding planes in the crust. Then magma enters these lines of weakness. By contrast, an extrusion is magma which cools into rock above the surface of the crust. Both intrusive and extrusive rocks are classed as igneous rocks. The process of forming intrusive rocks may take millions of years. As the rock slowly cools into a solid, the different parts of the magma crystallize into minerals. The crystals are usually larger than in extrusive rocks. Many mountain ranges, such as the Sierra Nevada in California, are formed mostly by intrusive rock. Often they are huge granite (or related rock) formations. Intrusions vary widely, from mountain range sized batholiths to thin vein-like fracture fillings. When exposed by erosion, these cores called batholiths may occupy huge areas of Earth's surface. Large bodies of magma that solidify underground before they reach the surface of the crust are called plutons. Intrusive structures may go between bedding planes of earlier 'country' rock. A sill is an intrusion which makes a table along bedding planes. A dyke is an intrusion which moves up, crossing older strata. This page was last changed on 1 August 2016, at 06:45.